An impressive style statement does not necessarily need flashy accessories. 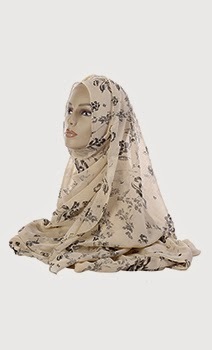 A simple Islamic scarf is far more fashionable than it seems. Known by the traditional name "Hijab", this scarf can be teamed up with most of your outfits, adding a modish appeal to your modest look. However, by picking the wrong shade, you may end up looking weird with the scarf. Here are some useful tips for choosing the apt color and also know about how you can drape these scarf in different styles. While the black and gray shades hold their importance, you can go for prismatic hues for a more blissful look. Choose vibrant shades if you have a bold personality. On the contrary, if you are more of a reserved person, wear scarves of muted tones. Make sure that the rest of your outfit complements the scarf. While wearing a hijab, it is preferable to choose a color that accentuates your eyes. Violet, blue and teal are a fine match for brown eyes. Bright green eyes can be complemented well by beautiful shades like pink, peach and red colors. Wearing the scarf in certain particular ways can make women look classy. Here are some superb styles of draping the scarf.